The historic Magnetewan River is accessible via a short 50 m portage from the SW end of Portage Lake, just minutes from the camp. Just upstream, Stovepipe Rapids is a springtime walleye hotspot, while downstream a mile or so, Little Island Lake is a popular destination for canoeists, campers and anglers. Most folks portage to the Magnetewan River for great early-season walleye fishing just below Stovepipe Rapids. In the deep pool below the rapids, walleyes bunch up and greedily pounce on live baits and jigs. 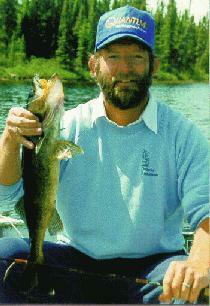 Later in theseason, walleyes scatter throughout Little Island Lake and can be caught where current flows are maintained. In Little Island Lake, smallmouth bass abound, but walleyes and northern pike can also be caught near weedbeds, rocky points and mid-lake shoals. An historic and scenic canoe route with easy paddling, few portages, great fishing and civilization never far away, it is no wonder that the Magnetewan River is one of the more popular canoe routes in Southern Ontario.